Hi, ya’ll. I am finally back after a long hiatus Its been a rough year with family issues and personal illness, but I am finally trying to get back in the saddle. I will be starting slowly with only a couple posts a week. This week I would like to introduce a wonderful friend and USA Today Best-Selling Author Leona Bushman. Penny Wise is tired of having her every move monitored by the king and queen and their guards, especially when there was only one who turned all her knobs. But running away when you are a princess of the realm proves harder than she likes, especially when the only person to hold your heart or obedience is the one to find you. Can she convince her parents to allow her to have the one she loves, or will they force her to marry for duty? Forced to endure yet another matchmaking scheme from her father, Victoria plans to spend the traincoach ride avoiding both of them. That plan changes when she meets the charming William Powell. However, things are not as they seem. William is more than a businessman, and her father has more than a business trip in mind. While on a traincoach trip to evaluate the track lines and different traincoach stations, Victoria and William endure unsettling times and don’t know where to turn when things turn ugly. They need to find out who is trying to kill Victoria. William has secrets, secrets that can both help and hinder the investigations. Can the high king bail him out, or would he be left hanging to deal with Victoria’s family alone? The only thing he cared about was protecting Victoria and convincing her he wasn’t one of her father’s tools. Can he do it in time? Do you like SteamPunk? What draws you to this genre? Welcome back, Cathy! I have missed your blog terribly and hope you are doing better. Kudos to Leona for this wonderful sounding book. 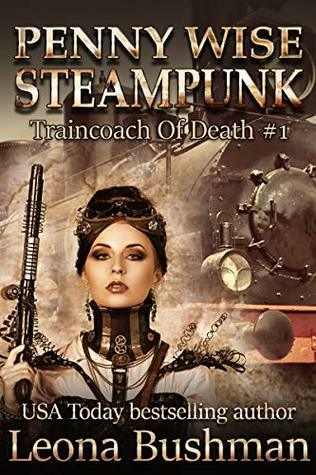 I have great admiration for steampunk authors. Thank You. I have missed my loyal readers. I think I am going to pick up these books they are short and it’s a different genre than I usually read.